Let’s go out on a limb here: The S&P 500’s recent rally, which as of yesterday had peaked last Friday (January 18), has been really big. 1. 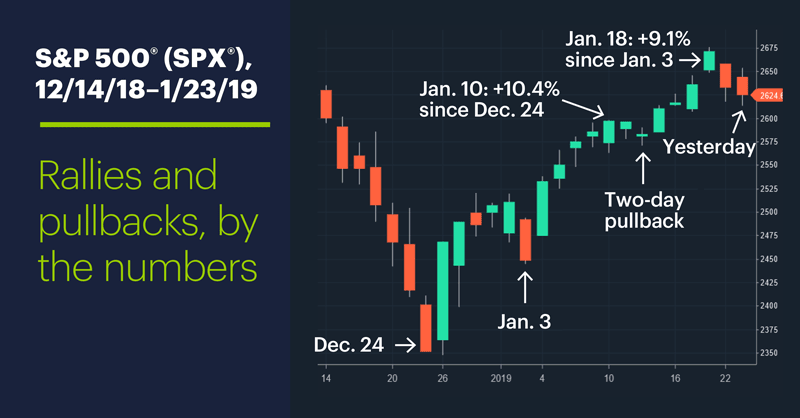 The SPX’s 11-day close-to-close gain from January 3 to January 18 was 9.1%—that’s 35 times the size of the average 11-day move (0.26%) over the past 50 years. 2. There have been only 89 other 11-day moves this big (or larger) over the past 50 years. 3. The most recent 11-day move of this magnitude was the 10.4% gain from December 24 to January 10. Before that, you have to go back to October 2011 to find one this big. Now let’s climb out on another limb: A market that goes up really far, really fast, is bound to retrace a few of its steps, even if it eventually moves higher. 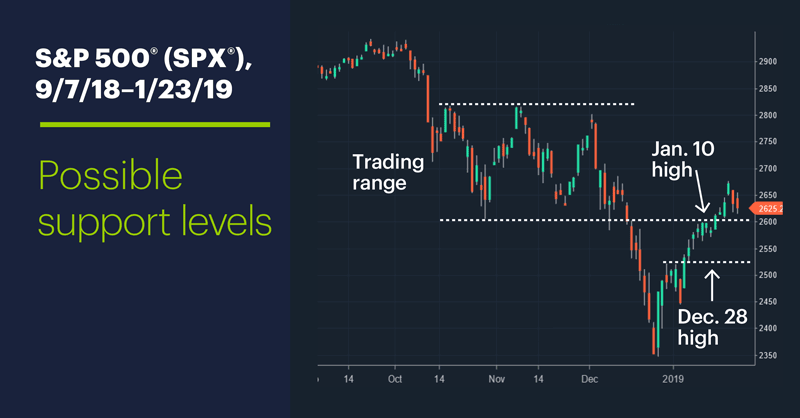 Conveniently, the chart above appears to support our modest hypothesis, as it shows the SPX pulled back for two days after the January 10 high, and yesterday made a lower low after closing down on Tuesday. ●The SPX was down the day after these large rallies 60% of the time, and down two days after them 52% of the time. ●The SPX’s median return after four days was -0.12%, and the index was lower 52% of the time. By comparison, the SPX was usually higher (55% of the time) after any given four-day period over the past 50 years. ●At day 5, the SPX began outperforming its average historical return. After 10 days, the index had, on average, gained almost six times as much (1.33%) as its average 10-day return (0.24%). In short, the SPX has had better-than-average odds of experiencing a pullback—lasting roughly one to four days—after experiencing gains like the ones we’ve seen recently. After that, it began accelerating to the upside. It’s critical to remember that historical performance stats such as these are mashups of a wide range of individual results—each instance is unique. Traders are likely to factor in the market’s current situation, along with the historical performance characteristics. In this case, for example, they may consider several outcomes, ranging from the possibility that the pullback could turn into something larger, to it adhering to the shorter end (e.g., a couple of days) of the spectrum. Between these two extremes are other possibilities, such as the SPX pulling back to the zone bounded by two of its December 28 and January 10 swing highs, the latter also being the lower boundary of the October–December trading range, as shown in the chart above. But once you have an idea about what the market “should” do, it makes it easier to adjust when it strays from its expected path. Market Mover Update: Options open interest in utility stock Evergy (EVRG) was more than six times its average rate yesterday; the stock traded within Tuesday’s range. Constellation Brands (STZ) will start today’s trading coming off of a 10-day closing high. Today’s numbers (all times ET): ECB Announcement (7:45 a.m.), Leading Indicators (10 a.m.), EIA Natural Gas Report (10:30 a.m.), EIA Petroleum Status Report (11 a.m.). Today’s earnings include: American Airlines (AAL), Bristol-Myers (BMY), JetBlue Airways (JBLU), Southwest Air (LUV), Textron (TXT), Union Pacific (UNP), Alaska Air (ALK), Intel (INTC), Norfolk Southern (NSC).